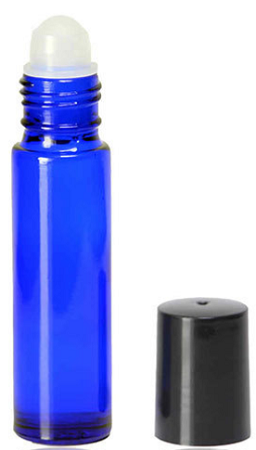 10 mL cobalt blue glass oil roller bottle. 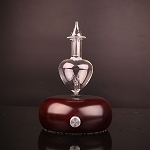 Glass has high clarity, can be colored, has high chemical-resistance levels, and has extremely high resistance to heat and cold. It is great for storing essential oils. All glass containers are lead free. This container is cobalt blue, an electric and vivid blue. In the case of glass, cobalt blue is made by mixing cobalt oxide into the base glass. This cobalt blue color provides some UV protection for light-sensitive products.